Pierre-Emerick Aubameyang and Ousmane Dembele have already linked up well during Borussia Dortmund's preseason campaign. New Borussia Dortmund signing Ousmane Dembele says he has settled in well at the club thanks to team-mate Pierre-Emerick Aubameyang. 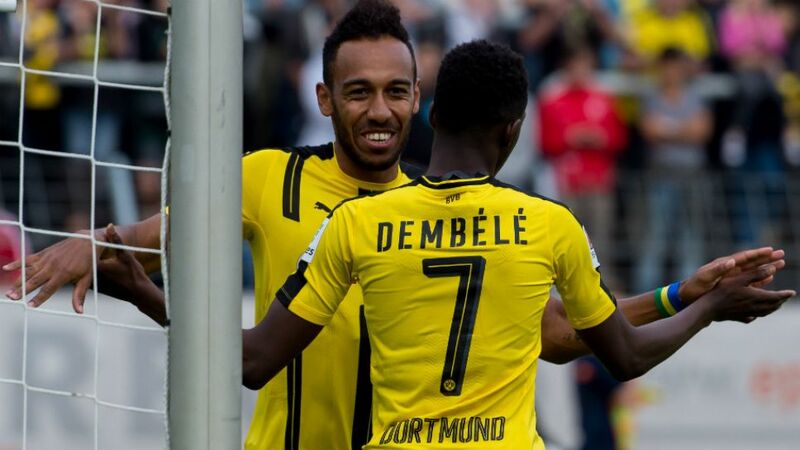 Dembele, 19, moved to the SIGNAL IDUNA PARK from French side Rennes during the summer and has revealed that fellow striker Aubameyang is playing an important role in getting the ideas of Thomas Tuchel, Dortmund's head coach, across to him. Want Dembele to play for you? Join official Bundesliga Fantasy and pick him now! "Auba is very important for me," Dembele stated. "He is my roommate, but he also translates on the pitch when the coach gives instructions. "I've been here for four weeks now and I can definitely say that I have been welcomed with open arms. My ambition is to work as hard as possible in pre-season so that I can get as many minutes on the pitch as possible during the season." Official Bundesliga Predictor - play it now! Aubameyang and Dembele have begun working together during pre-season, and the Gabon international, who hopes to help BVB close the gap to FC Bayern München in 2016/17, is already impressed with how his new colleague has tried to adapt to the demands of the Bundesliga. "He is a very nice young man," said the 27-year-old. "I help where I can and try to support him, so that he can integrate as fast as possible. You can tell that he wants to learn."